In an era of increasing polarization, Republicans and Democrats disagree over many things – and that extends even to the traits and habits they’d like or dislike in a new neighbor. 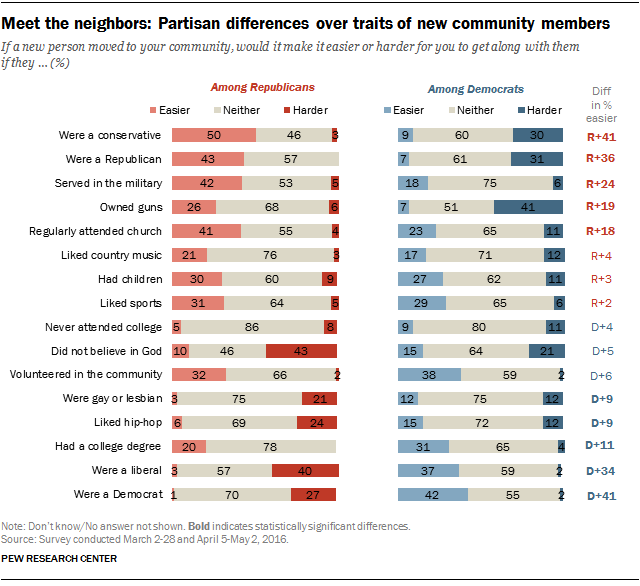 Some of the widest gaps in how people of different parties see new neighbors are over new community members who own guns, don’t believe in God, regularly attend religious services or have served in the military. A new Pew Research Center study of partisanship and political animosity finds that about four-in-ten Republicans (43%) and Democrats (42%) said it would be easier to befriend a new community member who shared their partisan affiliation. Conversely, 31% of Democrats and 27% of Republicans say it would be harder to get along with a new neighbor from the other party. Yet the partisan differences over hypothetical characteristics of new neighbors go beyond their party or their ideology. Democrats express more negative views of gun ownership than any of the other 15 traits asked about in the survey – even more negative than the prospect of having a Republican or a conservative as a new neighbor. About four-in-ten Democrats (41%) say it would be harder to get along with a newcomer to their community if they owned guns, while just 7% say it would be easier; 51% say it wouldn’t be easier or harder to get along with a gun owner. By contrast, 26% of Republicans say it would be easier to get along with a new neighbor who owned guns, just 6% say it would be harder and 68% say, in effect, it would not make much of a difference. Many Republicans say it would be more difficult to make friends with a new neighbor who didn’t believe in God. About four-in-ten Republicans (43%) say it would be harder get along with someone who didn’t believe in God, while 46% say it would be neither easier nor harder and just 10% say it would be easier. Among the 16 traits, the only one viewed about as negatively by Republicans is being a liberal (40%). Democrats have mixed views of a neighbor who didn’t believe in God: 21% say it would harder to get along with such a neighbor, 15% say it would be easier and 64% say it would be neither harder nor easier. Republicans are about as likely to say it would be easier to get along with a regular churchgoer (41% say this) as say it would harder to get along with an atheist (43%). Democrats’ views of a new neighbor who attended services regularly are, like their views of an atheist neighbor, more mixed. More than twice as many Republicans (42%) as Democrats (18%) say it would be easier to get along with a new arrival to their community who served in the military. Few Democrats say it would be harder to befriend someone who served; just 6% say this, as do 5% of Republicans. More Democrats (75%) than Republicans (53%) say it would be neither easier nor harder to get along with someone who served in the military. Democrats are somewhat more likely than Republicans to say it would be easier to get along with a new neighbor who had attended college (by 11 percentage points), who likes hip-hop (by 9 points) or is gay or lesbian (also 9 points). But majorities in both parties say it would not be either harder or easier to get along with these types of neighbors.